I love Neil Gaiman. He is brilliant, imaginative, and abso-friggin-lutely weird, and I love him for it. And this book of short stories and prose, Fragile Things, is by far my most favorite compendium of his. Fragile Things is a collection of oddities, retellings, poetry, spin-offs, and queer creations of Neil Gaiman's colorful imagination. Some of the stories have been published elsewhere, like Sunbird and October In The Chair, which were included in his M Is For Magic compilation, and some were published in other authors' works, written specially by Neil Gaiman, upon their request. A series of very short stories was inspired by an album of one of my favorite female indie artists, Tori Amos, who is good friends with Gaiman. There were award-winning stories here, too, such as A Study In Emerald which won the Hugo Award for Best Short Story and Sunbird, which received for its author the Locus Award. 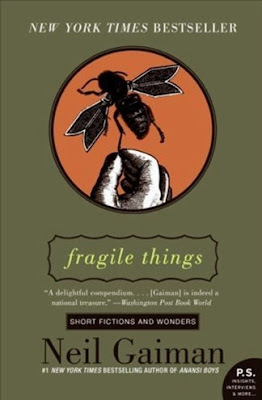 I had a difficult time picking a favorite story from Fragile Things, because I loved everything! But I finally whittled it down to five: Harlequin Valentine, a short story based on the Harlequinade pantomime; The Flints of Memory Lane, which gave me the creeps; Other People, because it gave me more of the creeps and some goosebumps, too; Feeders and Eaters, for the sheer weirdness and horror of it, and; The Problem of Susan, which retells, if you will, the story of Susan Pevensie of The Chronicles of Narnia after the series had concluded. If you've read the series, you'll remember that Susan was no longer included in the last books, as she had taken to fancy things and such, and was no longer “fit” to return to Narnia. On the other hand, I couldn't think of any short story or poem that I didn't like. The short story written specially for The Matrix, which Neil completed prior to the screening of the very first Matrix film, was, of course, a bit predictable, as it was made to cater to the plot of the film. Apart from that, however, it was still an interesting read, and I enjoyed that one nonetheless. If I were to use the word ”unputdownable” to describe a book, this is the one. No one in the world, I think, has a more vivid and odd imagination like Neil does. Plus, he writes just beautifully: simple words, straightforward language, languid construction. He is the best storyteller there is, period. And I am just itching to read more of his works!